Choices are one of the most alluring aspects of woodworking. Highways or byways. The journey, the side trips, the detours, the dead ends, the destination…with each route providing many feedback loops. 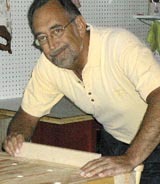 Read the entire Down to Earth Woodworker column, or take a look at the September issue of Wood News Online. For more great columns like this, check out Wood News every month. You can subscribe here. We’ve got a new issue coming out next week! Love your column, it’s down to earth kinda like my woodworking and probably many others.